Little Miss and I attended the preview of the brand NEW exhibition to hit the NGV Australia today: 'Our Land is Alive - Hermannsburg Potters for Kids'. 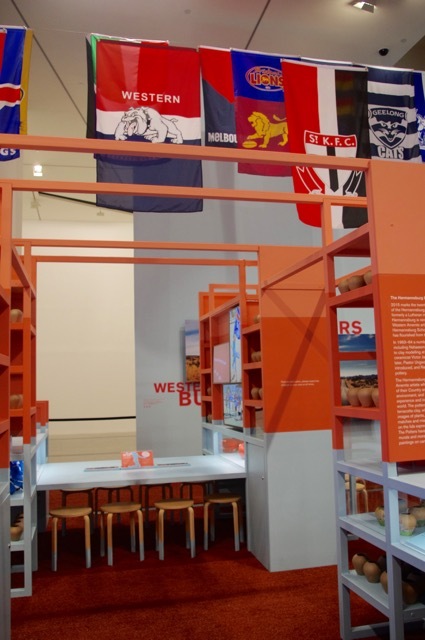 This new exhibition is all about Australian Rules Football and seems very fitting given that the AFL Grand Final is weeks away! 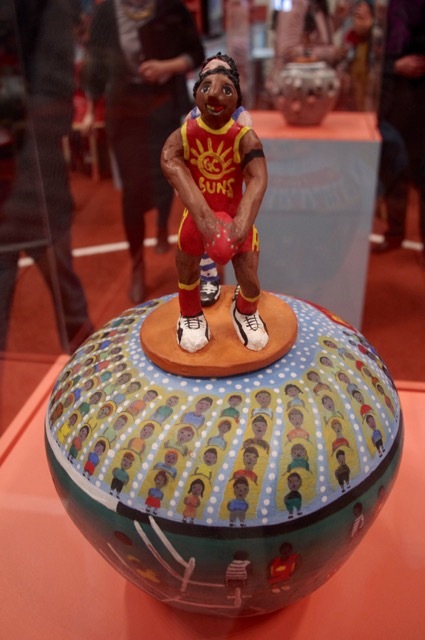 The Hermannsburg Potters who belong to a small community 130 kms south-west of Alice Springs, have created twenty pots depicting some of the AFL’s best and finest Indigenous players from all eighteen teams. This is the first exhibition by the potters which has been specially designed with children in mind. The Hermannsburg Potters are famous for their colourful terracotta pots which tell stories about their culture and where they live: their Country, the mission days, bush tucker and of course football! The pots on display show off important moments across many years of the AFL game. 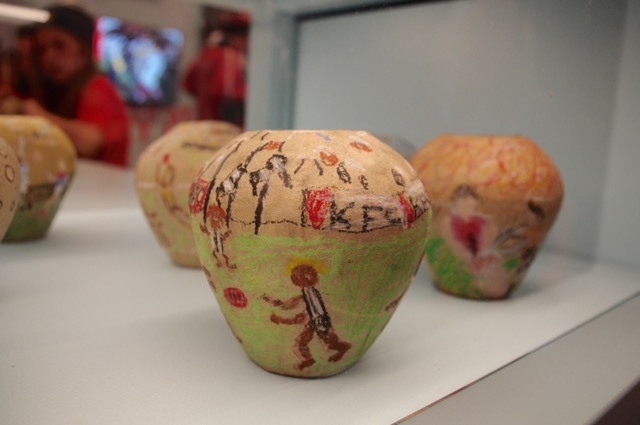 Children from the Healesville Primary School attended the exhibition preview today and participated in the pot drawing activity by decorating their own pots with their favourite AFL players. 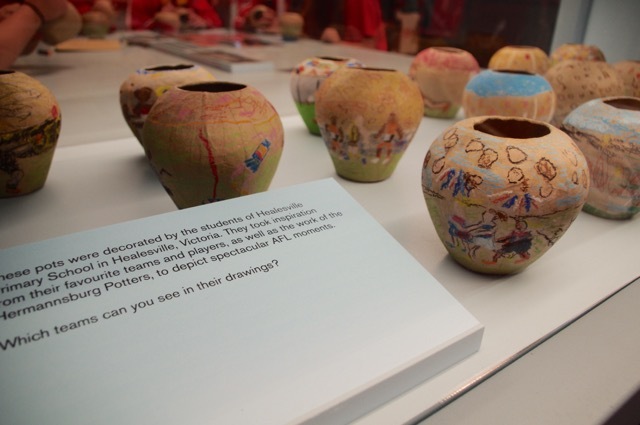 Some pots decorated by the Healesville Primary School will be on display during the exhibition. 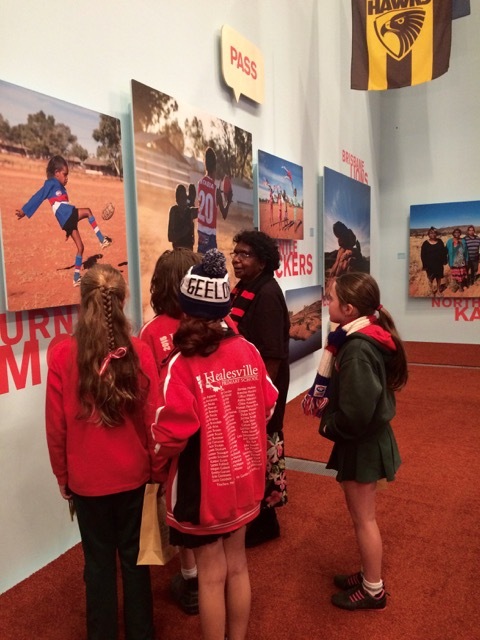 One of the potters, Judith Inkamala (pictured below) showing a photo of her grandson playing footy to primary school children on the preview day. Little Miss really enjoyed this exhibition. She really liked the space, looking at the pots, the AFL flags and footy balls but most importantly colouring her own Hermannsburg Potters style papier-mache pot. During the exhibition little ones and their parents can come dressed in their footy colours and spend time looking at the pots, read about special moments, tackle AFL quizzes, watch footage on screen and make their own pot to exhibit or take home. 'Our Land is Alive' Hermannsburg Potters for Kids is now open on level 3 (20th–21st Australian Art) at NGV Australia, Fed Square. Entry is FREE and the exhibition is open from Saturday 19th September till April 2016 10am to 5pm (closed Mondays excl. public holidays). The pop-up making activity is open from 10am to 3pm, more info on the NGV's website. Children can also meet and share their AFL stories with the Hermannsburg Potters on various dates where the potters will make pots in the exhibition space.